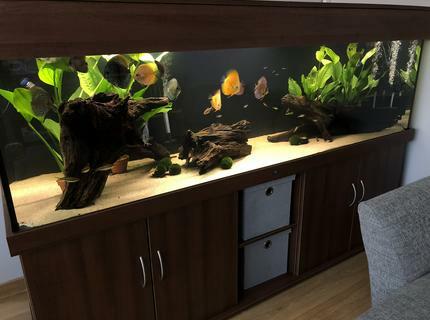 Description: Just finished setting up my rift tank and would like to share with the world! 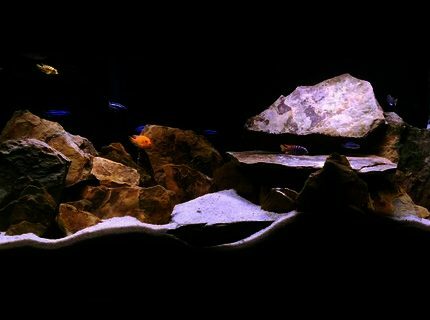 Ive been addicted to cichlids and have been caring for them for about 5 years now. Corals/Plants: Cryptocorynes, swords, anubias, vallus, canadian pondweed, water lettuce, dwarf water lillies. For the bigger hericthys, fake plants are better although they don't like to eat java moss. 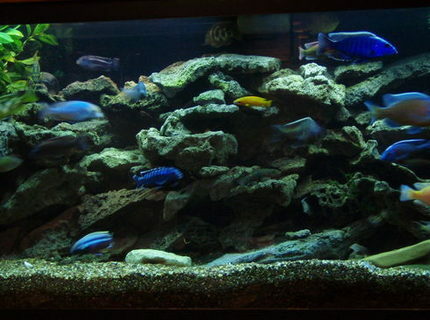 Description: My 55 gal cichlid tank w/Lake Malawi cichlids...white sand...2 underwater lights...green and red. Lace Rock. Using a fluval 305 canister filter. 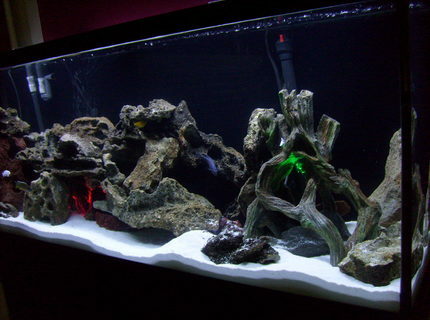 An overhead dual coral life aquarium lite w/one blue bulb and one white bulb. About Yourself: Started with a 1.5 gallon beta tank. went to a 10 gall then a 20 then a 29 then a 55. I'm stopping here for a while. Big fan of fish keeping. Hope to get a Frontosa tank soon as well as a general tropical tank. 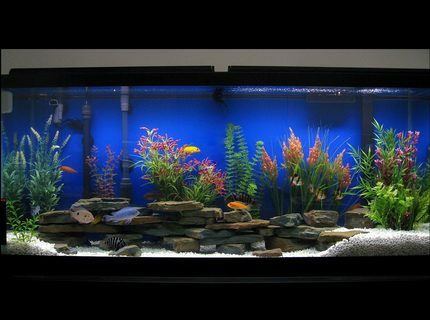 Fish Kept: Mbuna, Peacocks, Haps, and some victorian. Advice: Take your time and enjoy it.. Advice: Biotopes make more fun communities! 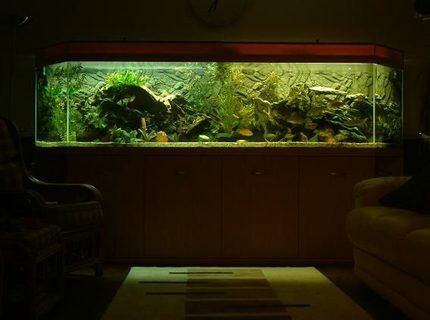 Description: West Africian Biotope(ish) I'm not super strict. 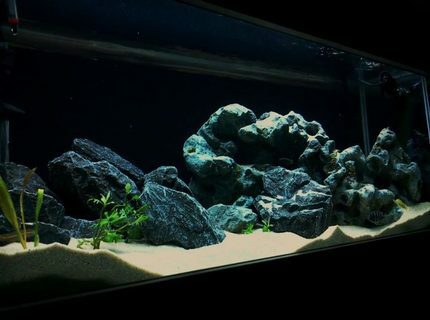 About Yourself: STARTED IN THE HOBBY WHEN I WAS IN 7TH GRADE, HAD A JACK DEMPSY-DIED, THEN OSCARS- VERY DIRTY, WANTED AFRICAN CICHLIDS FOREVER BUT WANTED A PROFESSIONAL SET UP, FINALLY GOT EM AND THE SETUP AND AM VERY HAPPY AND SATISFIED WITH FILTRATION, HAD A FEW COMMUNITY TANKS, I LIKE MY AFRICANS BEST. SALTWATER SOMEDAY, I HAVE A FRIEND WHO RUNS A CUSTOM AQUATIC BUSINESS, AND APRECIATE HIS HELP, ADVICE, ENTHUSIAM AND HONESTY. 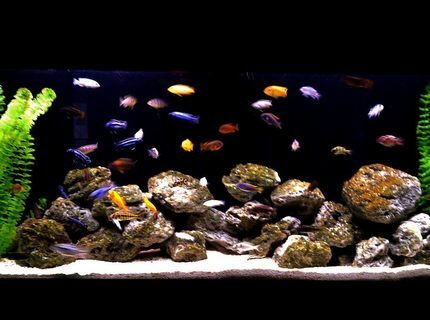 Fish Kept: AFRICAN CICHLIDS. - 2 new lamprologus compressiceps. 3- VENUSTUS' 1- YELLOW AURUATUS, 3 YELLOW LABS, 2 RUSTYS, 1 RED FIN BORLIES, , 1 ELECTRIC BLUE AHLI, 1 RED PEACOCK, 4 KENYIS, 1 BLUE EXASPERATUS, 1 AFRICAN FEATHER FIN CAT-SYNODONTIS, 1 ALBINO PEACOCK, 1 MIXED PEACOCK?, 1 BUMBLE BEA CICHLID, 3 KILLI FISH, 1 PEACOCK? 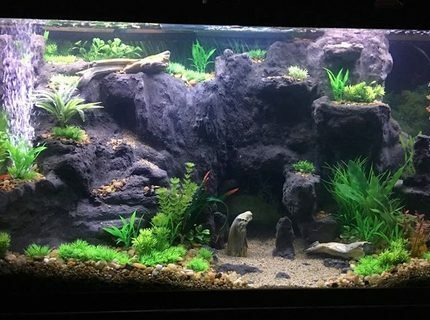 1 white pindani, 2 brichardis, 5 BLUE JOHANNIS, 2 CHINESE ALGAE EATER, AND 1 LAMP LELUPI, 2 TANGERINE CICHLIDS, 1 YELLOW TOP ZEBRA, 1 HYBRID SYNODONTIS CAT, 2 CHIPOKES, 2 BLUE MOORIS, 2 BLUE AURATUS, ALSO HAVE SOME BABYS (blue johannis, yellow labs, and rustys) THAT WERE CAUGHT AS FRY AND ARE GROWING IN REFUGIUM OF SUMP. 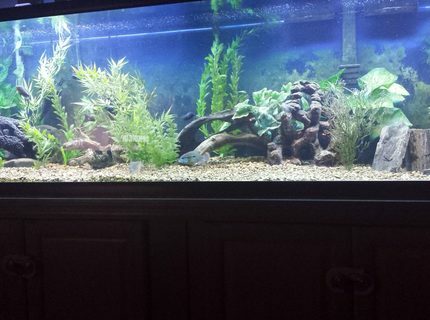 I HAVE PLENTY OF HIDING SPACES AND ANOTHER 20 GALLONS OF WATER BEING CYCLED THRU TANK FROM SUMP FILTER. FEEDING- SPIRULINA FLAKE, NEW LIFE SPECTRUM CICHLID PELLETS, FROZEN BRINE SHRIMP, GHOST SHRIMP, AND A CAUGHT A DRAGON FLY AND FED IT TO ONE OF EM. Corals/Plants: real JAVA FERNS, LARGE anubias, and wisteria in refugium.